World economic growth this year will be the weakest since 2009, the International Monetary Fund said Tuesday. 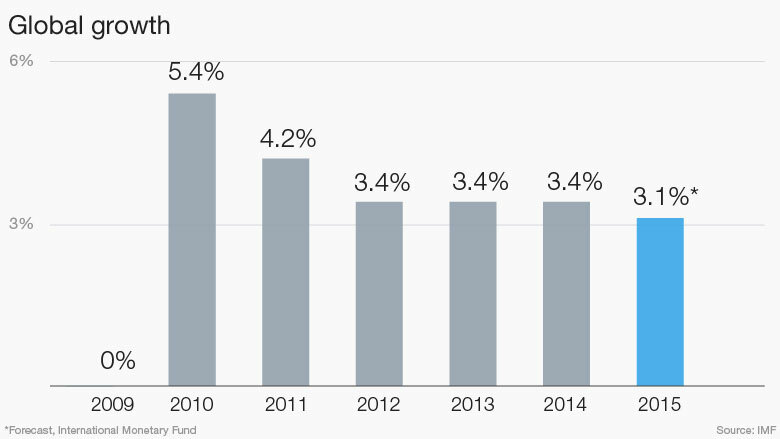 The IMF now expects global growth of just 3.1% this year, down from its previous forecast of 3.3%. It blamed China's slowdown, low commodity prices, and the expected increase in U.S. interest rates, for the slump. "Six years after the world economy emerged from its broadest and deepest postwar recession, the holy grail of robust and synchronized global expansion remains elusive," said Maurice Obstfeld, head of research at the IMF. The IMF said that increased market volatility in August, and the depreciation of the yuan, has fueled uncertainty and risk aversion. Political instability in many parts of the world is also stifling growth, it said. Growth should recover to 3.6% next year, according to the latest edition of the IMF's World Economic Outlook, but that forecast has also been revised down from 3.8%. The outlook for emerging markets and developing economies is particularly bad. They're set to see much slower growth than they're used to for the fifth year in row. "For this group of countries -- which now represents well over half of world GDP and will still generate the lion's share of world growth -- 2015 growth is projected to fall to 4.0 percent from its 2014 level of 4.6%," Obstfeld said. Emerging markets have been hit by capital outflows, the IMF said. Many developing countries have borrowed in dollars in the past, and are now seeing the value of those debts rise as their currencies weaken. And tumbling commodity prices have hit oil producing countries, such as Russia, Venezuela and Nigeria. The IMF also said growth in the United States was weaker than expected, despite a strong second quarter. But it suggested the slowdown has been caused by one-off factors, notably harsh winter weather and port closures, as well as cuts in the oil sector. "In advanced economies we project a moderate growth pick-up this year relative to last, notably in the United States and euro area," Obstfeld said.